There are many proposals that governments should nationalize, break up or “regulate” Facebook and similar platforms. Those proposals range from useless to dangerous. With one exception. The problem with the Facebook notification settings shown above is also the answer to two questions: can you really “quit Facebook” without hurting yourself in the foot? If yes, how? Quitting Facebook without losing your data? No problem. Then what? 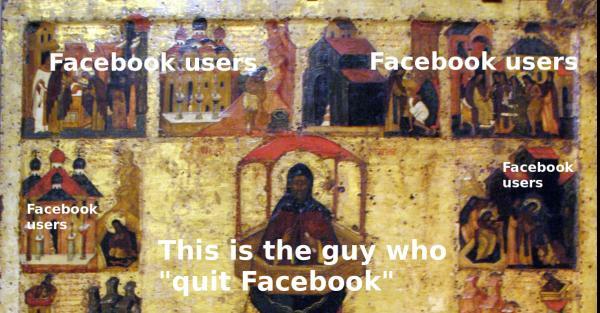 Many explanations available online about “how to quit Facebook” describe the same, easy procedure: first, download a copy of everything you put in Facebook: contacts, pictures, posts, everything. Then, delete your Facebook account. Done. Or not? In 90% of cases, “quitting Facebook” in that way is exactly as smart and useful as quitting a cellphone provider by moving all your contacts and files in your smartphone to another smartphone with NO radio circuits, that is without any connectivity at all: no phone calls, no SMS, no WiFi, no 2/3/4G, nothing. It’s the thing to do for the few who do want and can afford to go living atop a pillar, or in a cave, not for everybody else. The only way to really “quit Facebook” that respects civil and consumer rights and does not isolate people from each other is the concrete possibility to post to Facebook and receive Facebook notifications with any software application of your choice. Without using the Facebook website or app. This is everything but rocket science. It is Computers 101 stuff. What is missing from the picture above is a way to receive notifications via already existing, fully open standards like e.g. RSS, and post with similar standards. Standards that, unlike email or text messaging, are made to order for automatic aggregation and processing of notifications with any software. you would finally have choice. You could finally break free from the continuous tracking, advertising, distractions and general wastes of time that are built into the Facebook website and app, without any need to “quit Facebook” in the stupid, self-isolating way described above. Because you would still be able to write something to a friend who only uses Facebook; or know when somebody posted to a Facebook group you need to follow, or a friend would like you to join some discussion. Meanwhile, you could communicate and publish online as much as you want, in many other, less toxic ways. “[NO]. Facebook has just removed [from their programming interfaces] all functionality for publishing content on your behalf (1). [Now, facebook-cli only has “read” functionality], “and very limited at that”. you MUST give and maintain at ALL times the capability for your users to read and write content WITHOUT using your official software or website. Period.